Sometimes, inspiration comes just when you need it. I had returned from a wonderful Bakers Dozen tour of Harley Farms in Pescadero last month and was pondering what I could bake with the fabulous goat cheese I had scored when I spotted an article in the New York Times about the French enthusiasm for savory quick breads. Cakes salÃ©s–savory cakes–is the French term for these popular breads laced with cheese, meat and even vegetables. They’re homey loaves, as easy to stir together as muffins, and they’re served at picnics, parties and potlucks in Paris and beyond. Sliced or cut into cubes, they make terrific nibbles with a glass of cool wine on a summer afternoon. This was the ideal use for that log of creamy chevre that I had picked up at Harley Farms after a morning spent communing with the delightfully friendly goats. 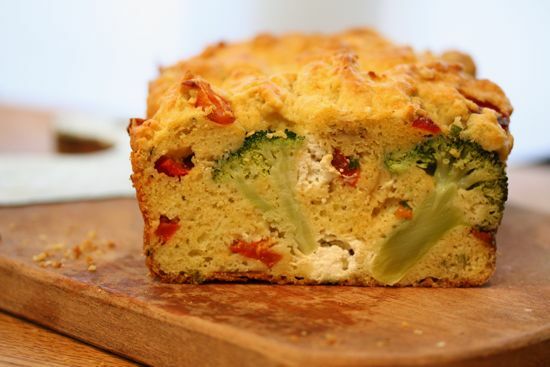 The basic recipe is infinitely adaptable and I knew the bright tang of the cheese would bring fresh flavor to a fine-grained bread packed with fresh vegetables. The first loaf was even better than I anticipated. 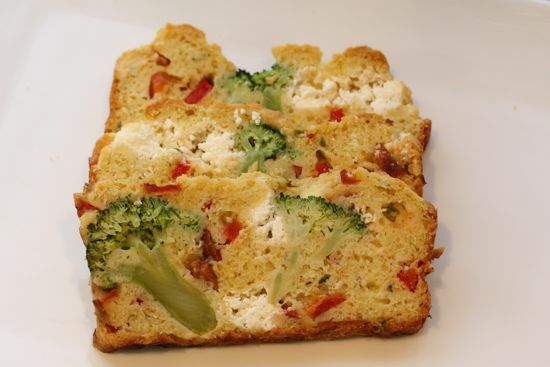 Warm out of the oven, the flavors of broccoli, roasted red pepper and goat cheese were irresistible. The colors were appealing and the broccoli design charming. The next day, though, the bread was a little dry. So I did some research and found a variation by Clotilde Dusoulier, of the “Chocolate & Zucchini” cookbook and blog, that substitutes yogurt for the milk used in most recipes. Yogurt did the trick. The next loaf stayed moist and tempting for a couple of days. Feel free to put your stamp on this bread. It takes just as well to cubes of ham and gruyere or bacon and cheddar as it does to goat cheese and vegetables. Stir up the basic batter, add your signature ingredients, turn into a loaf pan and bake. Serve with a glass of chilled rose on a warm Saturday afternoon, and you just may find yourself in a French frame of mind. Preheat oven to 350 degrees and butter a 9-inch by 5-inch loaf pan. Roast pepper over open flame or under broiler, turning often until charred all over. Place pepper in a paper bag, close, and let steam until cool enough to handle. Peel, seed and chop into ½ -inch pieces. Remove broccoli florets from stalk, leaving an inch or so of stem. Discard stalk or save for another dish. Blanch florets in boiling salted water for 2 minutes. Drain and rinse with cold water. In a large bowl, whisk together flour, baking powder, salt, pepper, and thyme. In a medium bowl, whisk together eggs, olive oil and yogurt until well blended. Make a well in the center of dry ingredients, pour in the egg mixture, sprinkle the minced garlic over all, and fold together with a rubber spatula until flour is barely moistened. Fold in roasted pepper and gently add goat cheese, being careful to keep the cheese chunks intact and evenly distributed throughout the batter. Pour about a quarter of the batter into the loaf pan and smooth to cover the bottom. Place broccoli florets in pan so they’re standing on their stems and resemble tiny trees. Spoon remaining batter into pan, filling in between the broccoli pieces, and covering their tops. Smooth top of batter and place pan in oven. Bake for 40-45 minutes, until cake is a golden brown and a toothpick inserted in the center of the loaf comes out with a few crumbs attached. Let cool in pan for about 5 minutes, then run a butter knife around the edges of pan to loosen the cake and turn out onto a rack to continue cooling. May be eaten warm or at room temperature. As usual, your photos are beautiful and stories inspiring! Yum. 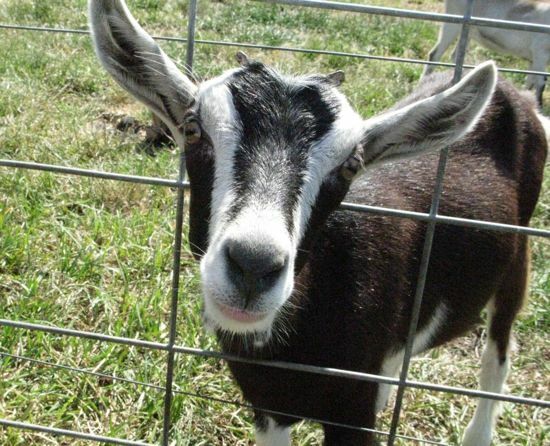 How did you manage to get those broccolis to sit so sweetly….sounds great and I love the goat! Glad you liked it….I put a little batter in the pan, then stuck the broccoli florets in it like planting a tree before spooning the rest of the batter around them. This is an excellent recipe! I followed it to the letter, and it came out absolutely perfect – the thyme adds such a lovely flavour. I will be trying this again with some ham and mushrooms… Thank you for another great post!